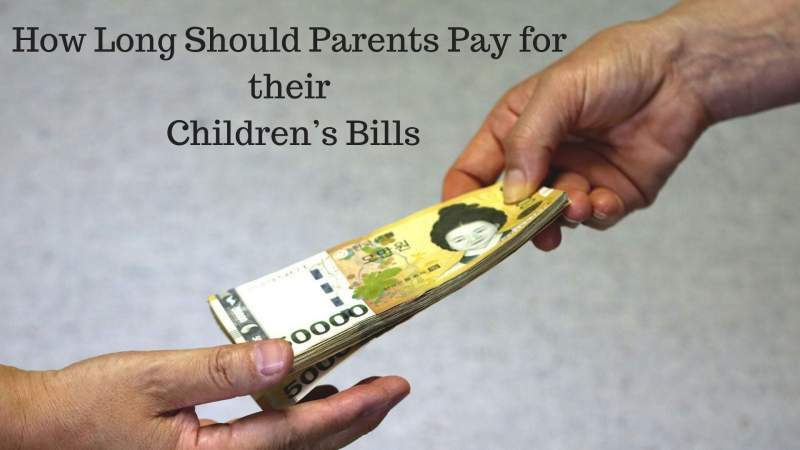 How Long Should Parents Pay for their Children’s Bills? The joy of all parents is to see their child grow up to be an independent and responsible citizen. Today, however, this dream is far from reality for both the parents and their children. Skyrocketing student loans knock on the door soon after graduation, and the nightmare of seeking employment sets in. We take a deeper look at this persistent problem and why it’s there in the first place. According to a survey, 2 out of 3 parents over the age of 50 have continued to support a child past the age of 21 for at least 5 years. Quite a statistic, don’t you think? Why is it so hard for these kids to move out and explore the world? According to Time Magazine, half of the youth aged between 23 and 26 have full-time jobs one year after graduation. In the same report, Time also found out that parents and children differ when it comes to the idea of when children should be financially independent. The parents say that at 25, children should be steering their financial boats while children say 27 is the ideal time. Even more interesting is that neither the parents nor the children believe it’s possible to achieve this feat at the stated age. The best time to have your children financially independent should be between 18 to 25. This age bracket accounts for those leaving high school and those graduating from college. However, cutting them off at once isn’t the best move. Make the transition as smooth as possible by teaching them financial lessons right from childhood. You cannot affect their financial literacy overnight; neither will they learn this if no one teaches them. Teach them how to use a credit a card by including them in your credit card plan. The ultimate goal is to set out the financial responsibilities to children as they grow older. By providing such education, they learn how money works and how to earn it on their own without having to open your wallet every time they come asking. Look at it as teaching them how to fish instead of giving them the fish. Creating a budget is a valuable financial skill to everyone with the aim of becoming financially stable. As a parent, you need to teach your children this skill because it doesn’t come naturally. One of the best ways to do this is by helping your children create their first budget. While doing this, outline the importance of budgeting and planning for their household expenses. The children will get a sense of financial responsibility as they step independently into the world. Apart from budgeting, educate your children about the need to shop wisely so they can always get the most value for the dollar. In addition, explain to them the difference between wants and needs, so they can prioritize household needs before luxuries. Some parents don’t have enough financial knowledge, or they simply don’t want to take part in such discussions. For this group of parents, engaging a financial professional is the best way forward. Arrange for a session with an expert and let your child tag along. Such sessions can teach them how to save, create an emergency fund, how to budget and more. Sometimes life is full of potholes and blind corners. As parents, the desire to jump in and rescue your children is irresistible, which is acceptable as well. You can bail them out by offering an urgent loans from Just Right Loans or if you feel philanthropic, you can pay their bills as a loving parent. Nevertheless, unless you want your wallet to remain open for many years, it’s time you close it for the benefit of both parties. As the parents, it’s important to analyze whether you’re doing more good than harm to your child. The ultimate goal for any parent is to provide the best possible life for their children, and that is commendable. As a young adult, you probably went through some struggles. You wouldn’t want your child to go through the same. Many times, the child will go behind the father’s back for help from the mother. You remember doing that, we’re sure. You now that only harmed the family relationships. Understand that these difficulties and the successes afterward are vital for your child if independence as an adult is both your and their goal. What’s more, parents should stay united in such matters. The debate rages on about when a parent should detach their children from the adult’s wallet or purse. However, the bottom line is that you’ll not live forever and your children cannot remain dependent forever as well. You have to prepare your child for the difficult and unforgiving world ahead by instilling these valuable skills at a young age and they need to make it a habit as they grow up.